Parts of the UK face high-to-very high levels of air pollution on Friday, prompting health warnings for vulnerable people. 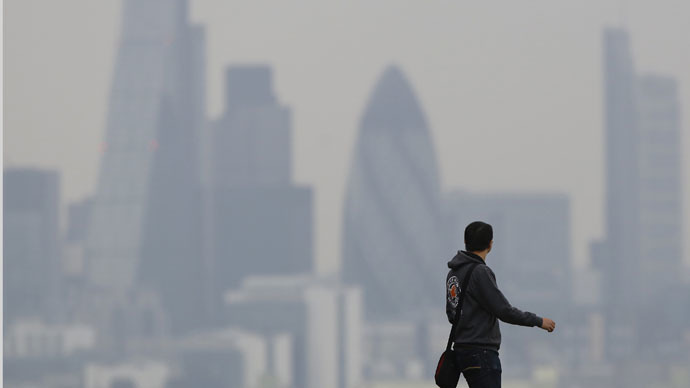 High levels of pollution are expected in some areas of southeast England and London, as Saharan dust from the south sweeps into the UK, mixed with local pollutants from traffic fumes and pollution from Europe. In areas experiencing very high levels of air pollution, adults and children with respiratory conditions, including asthma, and adults with heart problems were advised to avoid strenuous activity, especially outdoors. Dr Sotiris Vardoulakis, head of the air pollution and climate change group at Public Health England's (PHE) Centre for Radiation, Chemical and Environmental Hazards warned: “While most people will not be affected by short-term peaks in air pollution, some individuals, particularly those with existing heart or lung conditions, may experience increased symptoms. Simon Birkett, from campaign group Clean Air in London, told the Evening Standard that those preparing for the London Marathon should “very seriously consider” not training outside with high levels of pollution, but rather train indoors. However, the high levels of pollution are expected to be short-lived as Atlantic winds will disperse the polluted air on Saturday.